This is a long article but important so please read! Effective this calendar year as of January 1, 2018, our club has completely revamped our operating basis. Read on for details of this complete shake-up and rebirth for this digital age! There is no longer a $50/yearly (or $90 outside of the US) membership fee (or renewal fee) in which the person receives two printed glossy magazines. Lifetime Memberships are similarly canceled and are no longer in effect. Again: ALL EXISTING MEMBERSHIPS ARE HEREBY ENDED AS OF DECEMBER 31, 2017. WE ARE NOT GOING TO CHARGE FOR OR ACCEPT RENEWALS OR NEW PAID MEMBERSHIPS IN 2018. Those who had memberships in 2017 should have received their last magazine under those subscriptions: Journal #76. The last of them were recently mailed; if yours was not received please email and let us know. (I am greatly appreciative of the texts and emails received about your enjoyment of this latest magazine.) Effective in 2018, you will pay singly for magazines, calendars, events or anything else purchased here on the website. You do not need a formal membership, nor has anyone ever needed a paid membership to purchase items from this website. These days “membership” and “clubs” are more about social media groups which also are free. 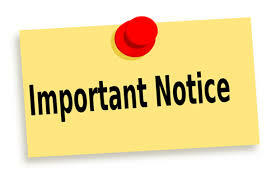 Therefore, I ask that you join our newsletter on this website, post comments here on the website blog posts and/or if you’re on Facebook, request to be added to our group there. However, please note that this is a “closed” group and the rules under our Terms and Conditions strictly apply. For those in the US, if you still want print magazines they will cost $25 per magazine plus shipping…so it’s close to the $50 total you used to pay per year. Those outside the US will pay the difference in their shipping costs. Others who prefer a digital magazine will have the option to buy and download them immediately thus pay no shipping at all. In this manner, our group can remain viable and we can continue our work of presenting photos, research, articles, interviews and other documentation surrounding the Jeanette-Nelson story. Reality check: The New York Times announced that within ten years, they expect to no longer offer a print edition newspaper. New York Magazine went from weekly to twice monthly. Other monthly magazines offer very cheap deals or free subscriptions (if you know where to search for them) simply to keep up the subscriber base and be able to sell advertising. All print magazines have had to rethink their survival…or shut down. For the Mac/Eddy Club, our revised structure seems the most workable system for 2018. A note about Lifetime Members: back in the day they received one of Nelson’s sculpture replicas as part of the their membership and the manufacturing+shipping cost accounted for most of what they paid. But still, they received free magazines, calendars and club meeting attendance. Our last Lifetime Membership was purchased in 2012; we removed that membership option shortly afterwards because the foundry we were using closed down. The majority of Lifetime Members go back many years earlier – some still from the 1980s. Bottom line, Lifetime Members have received far more in benefits than they paid – in most cases many times over – and we remain VERY GRATEFUL for their support. However, it is no longer viable to continue the club in this manner. As you know, we switched from traditional printing to print-on-demand some time ago to help keep printing expenses under control PLUS add the ability to use color inside the magazine. But at this writing, postage costs are close to $35 to ship a single magazine global priority to members in Europe and Australia! That means that for each Lifetime Member living overseas, the club pays close to $150/year per person to supply their magazines and calendar. In the US each magazine or calendar shipped costs $6.55 priority and in Canada it’s over $20. We simply cannot continue to absorb these costs. Event tickets at hotels have similarly risen in price and we have fought, for example, to keep our LA luncheon meetings affordable in today’s world at $55/person. For all these many years, we have concentrated on the QUALITY of the products we made available for you. Unlike other groups, we have never skimped on our beautiful glossy magazine, calendars or anything else. Yet we have sought to keep the club affordable for the older fans, many of them on fixed budgets, or younger folks starting out in life who discover Jeanette and Nelson wanting to know everything about them but couldn’t afford a membership or books or the items that they wanted. We have one elderly fan to whom I have sent club items for many years. She could never afford to pay but each Christmas sends us homemade cookies that she bakes for us. So…that’s how we’re moving forward this year. Even if the magazines can finally be self-sufficient with the above guidelines, some have asked me about other club costs such as running the website. They want to donate or have some kind of basic membership plan anyway…We have been discussing and possibly in the future we can address this. Certainly this last year there has been added expense in having to hire a 24/7 security firm to keep watch on the website. Last July we were viciously attacked and the site hijacked; not only this site but my author website and all websites of family members and some friends such as Judy Burns. Most sites had to be rebuilt, component by component; some have not yet even been restored. One of my plans for this website is a complete overhaul with an updated look for 2018…especially since more and more people access the ‘net via a smart phone or tablet rather than a computer. If you have ideas or suggestions of what features you’d like to see on this website, do let me know. But for now in 2018, the above is a workable system for our club. Plus this year I am finally tackling some projects that we have been waiting on…for too long. Have pulled back the reins, regrouped, shed some tears, squared my shoulders and gotten back to work. After all, I made a promise to Jeanette’s sister so many years ago…it’s time to once and for all to feel that I have achieved that for her, and for Jeanette and Nelson. Finally, for those who asked whether we will ever offer the Nelson busts again, the answer is yes, I have been working with a new foundry and am dealing with the logistics of getting the molds to them…but we will be offering them again as a single purchase, not as part of a membership. If you are interested, please email. Always feel free to email me with any questions or comments. We look forward to many more years of discovery with Jeanette and Nelson. It is still a thrill for me to today to get the mail, open a package and see a beautiful magazine cover with Jeanette and Nelson beaming off the page. I know that many of you feel that same thrill. Prepare biscuit dough according to directions. Roll mixture into a rectangle approximately ¼-inch thick. In a bowl, combine 2 tablespoons sugar, orange zest, cinnamon and cloves. Spread the mixture evenly across the dough. Roll dough jellyroll-style and slice into 9 evenly sized pieces. Meanwhile, heat undiluted orange juice concentrate, butter and ½ cup sugar and stir until completely blended. Pour juice mixture into 8-inch square or round baking dish. Place sliced dough rolls, cut sides down, across juice mixture. Bake at 425 degrees for 20 minutes or until lightly browned. Serve while hot. Makes 9 rolls. Backstory: in the early days of my research, I was taken to Tick Tock restaurant in Hollywood. It was a Hollywood landmark restaurant and I was introduced to Arthur Johnson, the owner. I interviewed him and he not only explained that Jeanette MacDonald and Nelson Eddy used to eat there fairly frequently in their heyday but he even showed me “their table.” The restaurant served homestyle, hearty food with huge portions. The restaurant was most famous for the basket of Sticky Orange Rolls placed on your table. Johnson said that Nelson in particular loved them. Johnson pointed out that while Jeanette picked at her food, Nelson ate heartily and would happily finish up her food. In addition, anyone questioning their close relationship only had to watch them eating off the same fork and sharing food. Johnson remembered them generally in a happy mood with Jeanette giggling a lot and Nelson the jokester. One time he remembered they’d had a quarrel or discussed something serious (but no, he didn’t know what it was about). Sometimes, Johnson explained, they would order food-to-go which THEY picked up on their way to a concert at the Hollywood Bowl. The restaurant prepared to-go meals for the two of them on several occasions. Their relationship was no secret, in other words. When I first went to the restaurant and asked about Jeanette and Nelson, the family knew all about their relationship and insisted I speak with Arthur for more details. When our club was formed, we had some early luncheons at the restaurant – where fans took turns eating at “their” table. As the attached article states, they served a tremendous amount of food! I remember that after you ate the Sticky Rolls and appetizers, they then brought out sherbet to cleanse your palette. (Believe me, you were already full!) Then onto your main course and delicious homemade desserts. The price was quite reasonable for what they served you. Johnson died in 1980 and we at some point moved the LA meetings over to the USO (courtesy of Bob Hope) and had our luncheons catered in. The whole area around Tick Tock and Hollywood Blvd in general became very seedy and the restaurant suffered and ultimately closed. 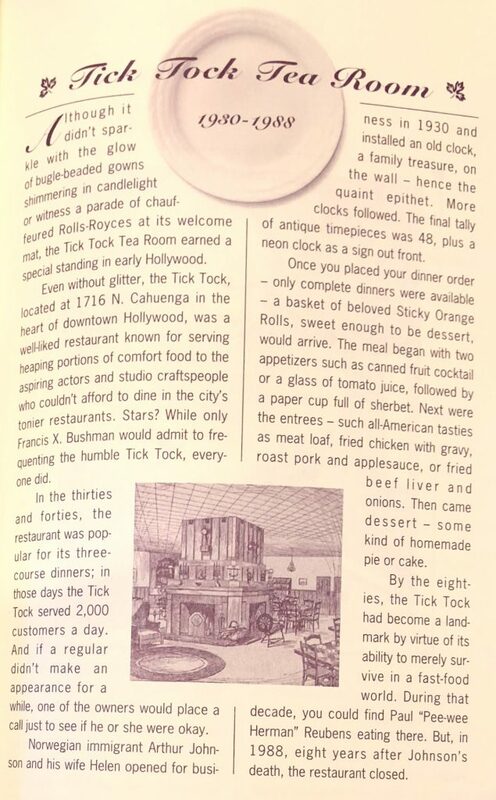 The recipe and details of Tick Tock restaurant were found in Hollywood du Jour by Betty Goodwin c. 1993.